I've always wondered how difficult it is to make seitan from scratch. I've seen recipes for it, but always figured it would be easier to just go buy the premade stuff. But that's when the availability of it comes into question. My neighborhood store, for example, doesn't carry premade seitan; they do, interestingly enough, carry vital wheat gluten flour. Was a homemade seitan experiment on the horizon? Yes! Weekend cooking experiment, woo hoo! And when I realized how easy and fun seitan is to make, I could barely contain my excitement. Imagine the possibilities! The simple, standard-ingredient recipe is directly from the back of the Bob's Red Mill Vital Wheat Gluten Flour package. 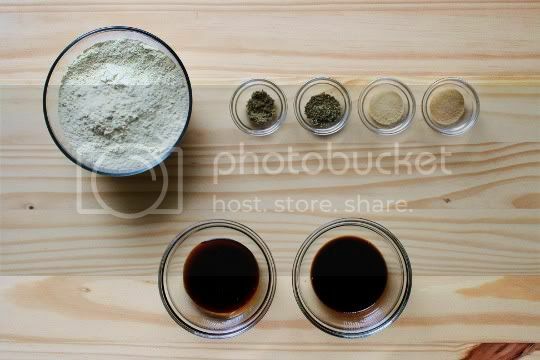 Simply mix together the flour and spices, then add water and stir. I was amazed at how quickly it "glutenized." Next, knead the dough until it gets really tough and elastic. The recipe suggests one minute, but you need more like five. I've compared other seitan recipe techniques, and found some interesting differences. Some knead for up to 10-15 minutes, then let rest and knead again. Some knead "underwater" and continue this process with multiple water changes until the water runs clear. Some add the finished dough to cold broth and bring to a simmer, others add it to already simmering broth. So you may need to make whatever changes are suitable for you, but this recipe is a good overall starter. The broth is a combination of water, molasses, and soy sauce. I probably would double the soy sauce amount, only because there's no salt included in the seitan. Or, try using a full-sodium variety instead of the low-sodium one I used. Or, you might want to try vegetable stock instead of water. Cut the dough into pieces or slices, then add it to the broth. I think in the future, I'll experiment with cooking one whole piece (maybe in cheesecloth) which I think would make it easier to slice as desired in the end. Here's the number one lesson I learned: use a BIG pot. The seitan will expand as it cooks, and I had more than a few boil-overs that required me to keep a close eye on the temperature with frequent stirrings. The recipe also doesn't mention if the pot should be covered or not; I covered mine, but because of the boil-overs, I alternated between covered and slightly covered. After about an hour, remove the seitan to a colander. When it was cool enough to handle, I actually squeezed the pieces because they seemed very dense and heavy. This could be due to the excessive wetness of the original dough, but I wanted my pieces tough and meaty. Also, I think it's important to get as much of the broth out as possible, since this makes for better marinating. So after all was said and done (yes, it seems complicated, but it's really not), I actually liked this stuff. I really liked it. Aside from it being a little too juicy (which is why I think the squeezing step is important) and not quite salty enough (more soy sauce in the broth, or add salt to the mixture itself), this seitan soaks up the flavor of whatever you put on it...which is a great thing. That--combined with the chewy, elastic, mock-meat texture--makes this seitan just like the premade stuff you'd find in a store. Experiment with different spice combinations for both the mixture and the broth, and go crazy with marinades (for the main photos, I used a hickory marinade and a grill pan, followed by a slathering of BBQ sauce...yum!). Even if you break down the cost for buying premade versus buying the flour and making it yourself, we're looking at dollars versus pennies. An 8-ounce package of seitan costs probably $4. A package of the flour costs maybe $7-8...but using half of that package to make a homemade batch yields probably three to four times what you'd get for the store kind! Yes, this one batch made quite a lot! Make again? Definitely. If I were pressed for time, sure I'd pick up a store brand. But any other day, this is where it's at. I can't believe I made my own mock meat, woo hoo! I get the BRM via subscription on Amazon! Making your own is actually easier than using the ol' boxed "mix" you usually find. But do yourself a favor and DON'T make it chick'n fried style like I did... ;) Ha. Who am I kidding, no matter how sinful it seemed it was damn good. I'm very impressed by your homemage seitan! This is definitely on my list of things to try making. 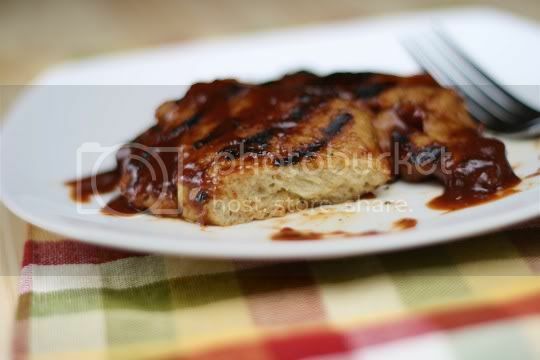 This looks great, I love homemade seitan! I've used the simmer method, but lately I wrap it in foil and bake it in a half-filled-with-water pan for about an hour, turning once. Less temperamental, to me, than simmering! If you want it to be able to slice it, add the soy sauce and broth to the dough, then after kneading wrap it tightly in foil (tootsie roll style) and steam it or bake it in a water bath for 1 1/2 hrs. You can get some nice deli slices using that technique. Thanks all! I think I'll definitely try the roll-and-steam method next time. you know, you can just make vital wheat gluten out of whole wheat flour - make a dough out of 1 part flour, 1 part water, soak it in water for 30 min, and then squeeze out the starch underwater, and you have vital wheat gluten! no need to buy a $7-8 bag. GREAT article! i love the experimentation. :) saving this one to cookmarked.com for safe keeping! If you add more salt to the seitan then later on when you add a sauce or marinade it will then be too salty. I'd accidentally thrown out the Bob's package and forgot to copy the recipe on the bag. Found you when I googled it. Thanks for posting this! How long can we store the homemade seitan in the fridge? Tina, probably about a week. I haven't tried freezing it, anyone else have success with that? Yes, it freezes great. We make a large batch and freeze small portions for those evenings when we don't really have time to cook. i bought a package of wheat gluten, but it didn't have the recipe on the back of the package!! Do you have it anywhere? The recipe link is at the bottom of the post. Enjoy! I couldn't find the link, the recipe is not on this page, can you please post? 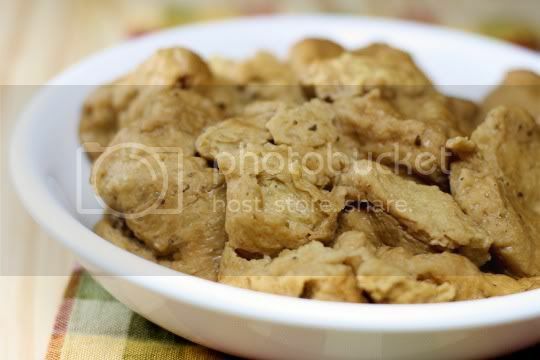 There's a link "Basic Seitan" at the bottom of the post, right above the Facebook Like button. Wow! That sounds fantastic. I haven't thought of using vital wheat gluten. The recipes I have come across were so labor intensive, that I gave up the idea of trying to make seitan at home. I am encouraged by this post and look forward to making it now. It is so much more inexpensive this way. But how come the stuff you get in the store is dark brown, whereas in the picture here is it is lighter? Is it because of the stock? If you want it darker, you can add different things to the seitan itself, not the broth. Partisan brownish essence is my go-to - dark soy sauce will do the job too but may make the end product too salty. To me nothing compares with RAY'S WHEAT MEAT. I served to my family when the visited and they thought it was veal. The home made seitan couldn't compare. If you are in NYC area I know Candle Cafe and Candle 79 use it for their Seitain dishes and Karma Cafe in Red Bank, NJ does too. The whole foods at Columbus Circle sometimes as it as "chimmuchurris" at their DELI, and sell by the pound. It's not always in the case so you have to ask for it. Best deal is to special order it through Commodities East in NYC (lower east side). I order a 5lb bag and split it up into 1 lb bags and freeze. Stays for a year. And thaws great. I lightly bread and brown in olive oil with a dash of garlic/salt and pepper... to die for! Wow, I didn't know you could order bulk from the seitan place that supplies Candle 79/Café. I make my own and it's good, but that stuff is great. Thanks. How do you special order it? Would any supermarket be willing to do so? I live Upper East, so Commodities is a bit out of the way. I am making this right now. How did you get the burn marks? Is that just bbq sauce? 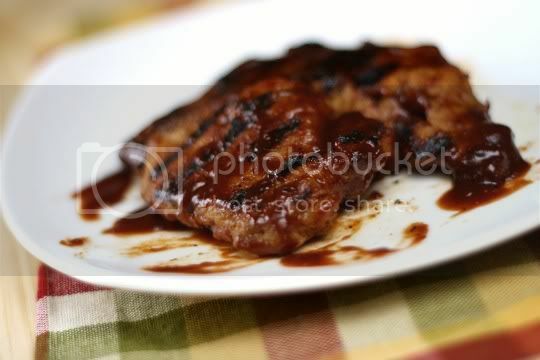 I just used a grill pan sprayed with a little cooking spray, then slathered each piece in my favorite BBQ sauce. Let us know how it turns out! "Some knead "underwater" and continue this process with multiple water changes until the water runs clear." This is done when using flour to make homemade seitan; not when using vital wheat gluten. 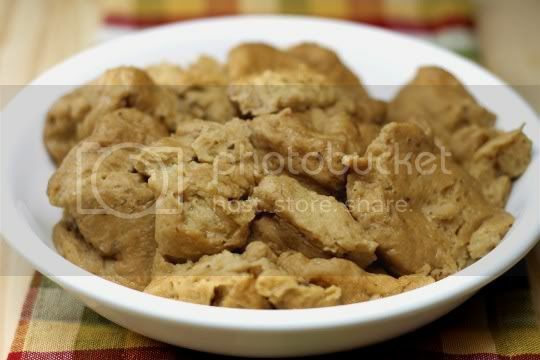 You can cut your cost even further by making seitan from making your own vital wheat gluten from flour. . . . . sounds complicated but it's surprisingly easy and fun! It's funny you use packaged vital wheat gluten over making your own because it's "water wasteful". How do you think the packaged stuff is made? Water is used! You just don't see it. So using the packaged stuff really doesn't save water. As for time consuming, only people who truly love creating from scratch will find it completely worth the effort. It also cuts your cost even more.